"Finn said art isn't about drawing or painting the perfect bowl of soup. It's about ideas. And you, he said, have enough good ideas to last a lifetime." June has a special relationship with her Uncle Finn. Finn is a famous painter who lives in an apartment in New York. June has always had a hard time fitting in with her family and peers. Finn offers her an escape filled with culture, exploration, and understanding. He accepts her for who she is and indulges all of her quirks and curiosities. The year is 1987 and June's world is beginning to change. Finn has been diagnosed with a mysterious illness. Her parents, both accountants, are in the thick of tax season and spend little time at home. Mom has been very muted about Finn's illness. June is only allowed to visit him during weekly trips with her mother and sister. She knows little about AIDs, but June sees the debilitating effect it is having on her beloved uncle. After weeks of deterioration, Finn finally succumbs to his illness. June is devastated. The only person who truly loved her for who she was is dead. Mom seems eager to put the whole ordeal behind them. While the rest of her family seems keen to leave the memory of Finn in the past, June wants to know more. Who was the strange man at Finn's funeral that had Mom so upset? Did that man really kill her uncle? And what has become of Finn's apartment and possessions? 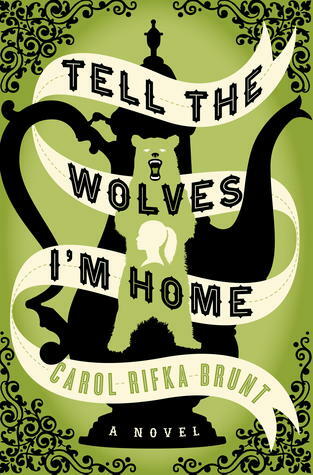 In Tell the Wolves I'm Home, author Carol Rifka Brunt presents a deeply moving coming of age story about love, loss, and acceptance. By having fourteen-year-old June narrate the novel, the author makes the heavy topics a bit more palatable. We feel every emotion of June as she discovers the cruelty and ignorance that surrounded the AIDs crisis. At its heart, Tell the Wolves I'm Home is a coming of age story that manages to weave larger themes into its foundation. From the very first page, the book captured my emotions and imagination. Tell the Wolves I'm Home is a stunning debut novel that will have you contemplating its layers long after the final page. This entry was posted on Sunday, January 22, 2017 and is filed under AIDs,Carol Rifka Brunt,Coming of Age,Fiction,Tell the Wolves I'm Home. You can follow any responses to this entry through the RSS 2.0. You can leave a response. I definitely shed some tears, but it was totally worth it! I am glad this is one that you were able to love so much! I haven't heard of this one before, but it sounds so sad that it would make me cry. It sounds so moving... thanks for introducing it to me with your review! I hadn't heard of it before I read it either. I love finding hidden treasures!